A few weeks ago in my last article, I was in my usual nostalgic mood right after the Christmas holidays. I talked about the exciting new offerings awaiting guests at Walt Disney World in the coming months. The new technology and storylines are “magical” to say the least, but as Walt once quipped…” I hope we don’t lose sight of one thing, it was all started by a mouse” Walt hated sequels, never one to rest on his laurels, he demanded new and fresh entertainment for his quests. But sometimes, in order to understand how unlimited the future is for Walt Disney World, we must explore and understand its past. Too many guests gloss over the classic rides and attractions for the latest and greatest, forgetting just how the iconic classics of the past made Disneyland and all its offspring the world’s greatest entertainment venue. Many of these classics are over 55 years old, and still delight today. Walt Disney’s Carousel of Progress is easily one of the Magic Kingdom’s favorite attractions. In fact, it is the longest running stage show in the history of theater in the United States, seen by millions of people! But how many people know that this attraction was one of Walt’s personal favorites and that he helped develop it from beginning to end. And this Carousel of Progress had its roots in the late 1950’s when Walt decided to expand Main St. in Disneyland with two additional districts: “International Street” and “Edison Square”. In the Edison Square district, guests would see a show to be hosted by an “electro-mechanical” man called “Wilbur K. Watt” The show was to highlight the advances of Electricity from the late 1880’s to the present and future, all thanks to the amazing advances Thomas Edison made through electricity. After each act of the show, the guests would walk to the next act. However, the Main St. additions never came to fruition. The main reason being that the technology of the day was not up to putting on a show that Walt wanted. But this idea of showcasing the advancements of electricity always stayed with Walt. The big break for the budding Carousel of Progress came in the early 1960’s when many companies were preparing for the New York World’s fair in 1964 and 1965. The Walt Disney Company, then known as “WED Enterprises” (For Walter Elias Disney) was approached by several companies to help create and design exhibits to represent them at the fair. Walt was elated to work with a company who would fund the project and help develop new technology. So when General Electric approached WED Enterprises, Walt recalled the idea of Edison Square and the show about electricity and the General Electric executives loved the idea! By this time, technology finally caught up with what Walt wanted for his project. Unlike in the late ’50’s, the Imagineers now developed the means to operate the “Players” in the show. From the birds in the “Enchanted Tiki Room” and another famous “Audio-Animatronic” figure, Mr. Lincoln in the “Great Moments with Mr. Lincoln”, which was also an attraction designed for the World’s Fair, the Carousel of Progress was now possible. He even jumped into the tub that Cousin Orville was supposed to be to show how the scene should look and even provided some dialogue. Even the song for the show was explained with enthusiasm by Walt to Disney Songwriters Richard M. Sherman and Robert B. Sherman and they responded in Kind with the favorite tune we all know and love; “There’s a great Big Beautiful Tomorrow”. Walt loved this attraction so much because he himself was so excited and optimistic about the future. The show opened as the exhibit called “Progressland” and it was an immediate smash hit. Even though more than 200 people entered and exited every four minutes, there were still waiting lines over an hour! Due to its immense success, General Electric decided to sponsor the attraction at Disneyland. The Carousel of Progress opened at Disneyland on July 2nd, 1967 and ran till September 9th 1973. It was then moved to Disneyworld in Florida in Tomorrowland where it had its grand opening on January 15th, 1975. The show provides guests with four “Scenes” of a typical American Family going through the 20th Century and how they experienced the new ideas and advancements from one generation to another. It begins at the turn of the century on Valentine’s Day, the 1920’s on the Fourth of July, the 1940’s on Halloween and finally, the last scene which received the most refurbishments to keep up with the changing times, wintertime, Christmas in the home. The theme song changed in 1975 to “Now is the time”, to go with General Electric’s new campaign slogan, written by the Sherman Brothers. Finally, in 1985, General Electric decided to drop sponsorship of the attraction and it was closed for refurbishments again to remove references to GE. It again was closed for changes in 1993 and re-named “Walt Disney’s Carousel of Progress” and a Great Big Beautiful Tomorrow was returned as the theme song. The one thing about the Carousel of Progress is that the attraction itself has been updated several times in order to stay in step with “Progress” through the years. There were many new cast “Voices” for the performers during the years, even the dog at John’s feet has changed color, breed and has been called different names during the run of the show, i.e. Sport, Buster. He is now called “Rover”. There were several cosmetic and set changes. The biggest change was in the last act. This was changed in 1994 to “Christmas in the House of 2000”. This updated the 1960’s era of VCR’s and regular TV to the high-tech big-screen TV and electronic video space game. 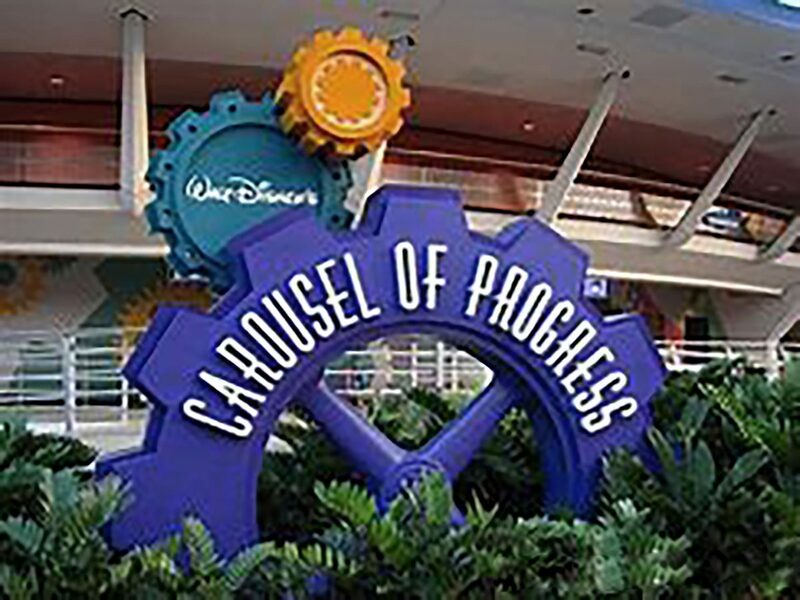 Some interesting notes about the Carousel of Progress. In its original conception it revolved clockwise, it now rotates counter-clockwise. Only the father, John actually speaks to the audience, all other family members speak to each other. Uncle “Orville” used to be Cousin Orville. Daughter Patricia was once Jane. Famous voice actor Mel Blanc, the voice of Bugs Bunny does the voice of Uncle Orville and his son, Noel Blanc voices son Jimmy. The cast for the show is as follows: Father (John), Mother (Sarah), Grandmother, Grandfather, Daughter (Patricia), Son (Jimmy), Uncle Orville and of course Rover the dog. The Carousel of Progress has been seen by more people than any other theatrical show in the history of American theater. The show can hold 226 people per theater, and revolves about two feet per second. The show runs 20 minutes and 45 seconds. Even though there have been rumors of a permanent closure, Disney has said there are no plans for any closure at all. This is an attraction that Walt himself said should never leave Disneyland or ever close. Although it did leave that hallowed park, it continues on today at the Magic Kingdom, and even though it has been running for more than 40 years, it still is as popular as it was in the New World’s Fair. So the next time you ride this fabled attraction, keep in mind that it was Walt’s favorite!